On Phillip's and my first Valentine's Day as a married couple, we didn't have any money. I didn't really want anything, anyway, so I just told him to write me a love letter. And then when he did, I figured that I should probably write one to him, too. By the next Valentine's Day, our first baby had already arrived so we decided to include her in the tradition - why not? In addition to writing to each other, we also each wrote to her on her first Valentine's Day, and I put them in an envelope for when she's older. As we added children to our family, we kept adding letters every Valentine's Day. 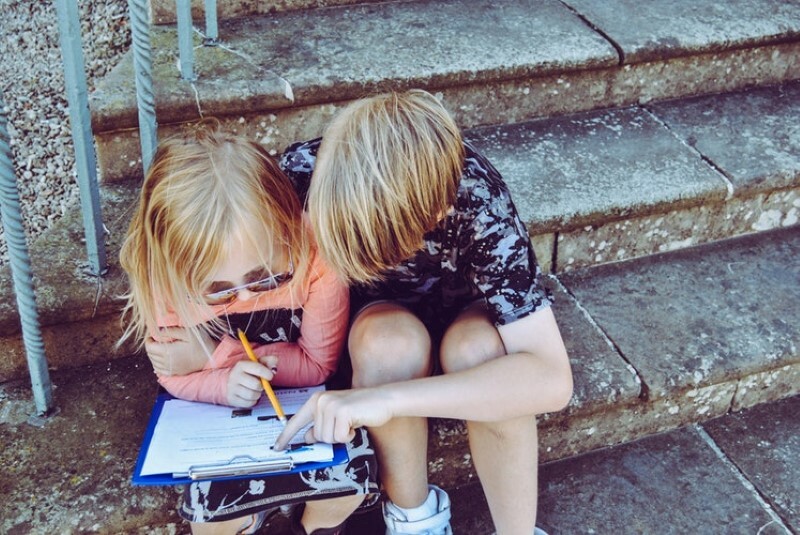 Whether it was because we didn't have a definite plan for how many children we'd have or because I'm bad at math, I didn't realize that it meant I'd be writing 7 letters each and every February, as well as helping the younger kids with theirs. 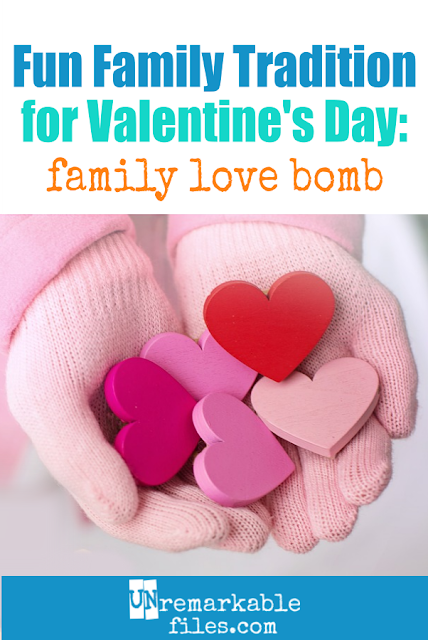 It's kind of a lot of work, but it also gives rise to my favorite family tradition: the family love bomb. Instead of just giving each other the letters, we make an evening out of it during the week of Valentine's Day. You should see how giddy everybody gets when it's their turn to hear all their letters. The younger kids quite literally bounce around like pinballs, the older kids try to hide how secretly pleased they are, and I'm not going to lie: even I look forward to it. Believe me, there are certain personalities and maturity levels in our family who aren't altogether comfortable with reading their letters out loud. The uncomfortable shifting and the awkwardness usually peaks in the tween years. 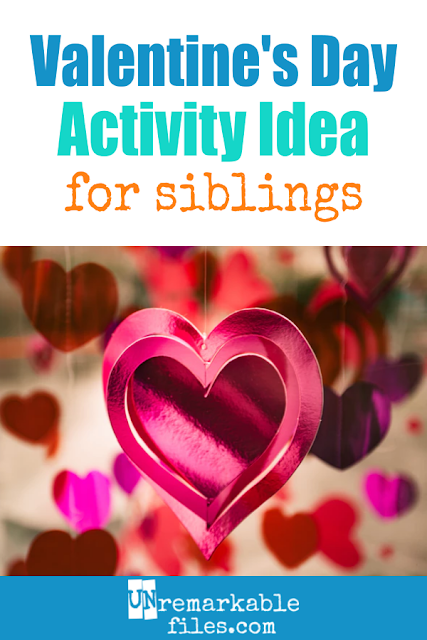 And even if they might have trouble making eye contact when they read "I think you are a good sister," I think it's an important way to develop our family identity. Research has consistently shown that kids with a strong sense of family identity have higher self-esteem and are better able to deal with the effects of stress and peer pressure. I was recently horrified by a mom blog article that actually advised parents not to praise a child in the presence of a sibling to avoid making the other kid jealous. That is BULL-oney. With extra bull. I want the kids to hear us praising their siblings, and not only do I want them to hear it I want them to do it, too. We are all unique and wonderful in this family, and letting each other know it is important. By early elementary school, they usually have ideas about how to write their letters all on their own, and by the time they're older they don't need much help from me. If they're stuck on what to say, I usually suggest brainstorming three nice adjectives about the addressee, and write about a time something happened that illustrates one of the adjectives. February is a lot of work in our house, and I'm not exaggerating when I say I carry around a clipboard with a chart showing who has written to who. But it's worth it. Not only is our annual family love bomb something the kids and I look forward to every year, I also smile every time I tuck their letters away into their respective envelopes and think about how much fun it will be for them to look back on those letters 20 years from now. I think this is a really lovely idea! My kids like to make each other birthday cards. Sometimes they get pretty complex, with word searches and pop-ups. Have never thought of suggesting they make valentines for each other though. When I was 15 I hated my 12 year old brother. It wasn't until I heard my 27 year old brother (whom I looked up to very much) tell me how much fun he has with lil bro and all of his strengths that I realized I hadn't seen so many of his good qualities and was pretty much missing out. Sibling praise works! I tell my kids how great each other are all day long--especially when they come to me complaining about each other. We have a similar tradition in our family but it centers around birthdays instead of V-day. On a family evening just after the person's birthday, we all get a sheet printed with "Johnny/Susie is special to me because..." and the date. Then we each illustrate something that we find noteworthy about that person and share them before filing them away with papers from previous years. (We are all terrible and hilarious artists.) The person of honor gets a paper labeled, "Some of my favorite things..." Eventually, these will be bound somehow and given to the kids as they leave home. We've been doing this for over 15 years and have gone from simple scribbling and captioning by a parent, to comic strip layouts. You never know when a simple idea will take on a life of its own! I was recently horrified by a mom blog article that actually advised parents not to praise a child in the presence of a sibling to avoid making the other kid jealous. I can't even express how horrific this is. Those poor sibs! 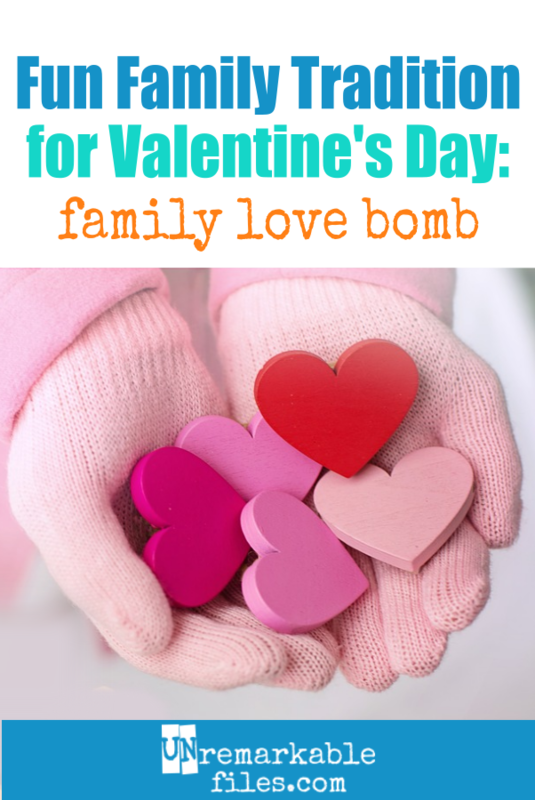 And oh yes, sorry, I was so scarred by that comment that I forgot to say how much I love your Valentine's love bombs!! So precious! And lifetime memories are made exactly like that. Y'all are gold star parents! Her rationale was that if one child hears you tell their sibling what a good artist she is, all they will hear is "you're NOT a good artist." But I think that's really a self-fulfilling prophecy. If a kid doesn't grow up learning that everyone has strengths to be celebrated, s/he probably WILL take it that way whenever anyone else gets a compliment! In so many instances, they really do listen and learn more from each other than they do from us. So glad for the times when the older kids are setting a good example because it really impacts the younger kids in a way that Phillip and I can't! However and whenever is a great idea. Birthdays are another awesome time for this.